One of the best benefits of learning about your personality type is learning to see your blind spots and weaknesses and find effective ways to deal with them! Most type descriptions out there will describe a healthy version of a type. This is good because it allows us to see ourselves at our potential! But what if someone isn’t really at their best? What if we’re trying to type someone who is unhealthy, repressed, or imbalanced in some way? What if we’re the ones who are unhealthy or imbalanced and we’re struggling to relate to these one-sided descriptions? Well, that’s where this post comes in. In this article I’m going to show you how to recognize unhealthy INFJs and the weaknesses that INFJs can fall into when they don’t have balance. Keep in mind, I LOVE INFJs. This article is not meant to “bash” INFJs in any way at all (I’m an INFJ too, after all!). Every single type can be unhealthy, this article just gives us ways to spot imbalance in ourselves so we can avoid hurting ourselves or others. It can also help us to spot when others are unhealthy and we can be more understanding of them. Healthy INFJs quickly see numerous perspectives and abstract connections in themselves and the world around them. They pick up on unconscious meanings and symbols that relate a future outcome or prediction. They are good at finding creative ideas and strategies, and they are motivated to help people. They tend to be idealistic and visionary in their approach to life. They are always trying to discern “the big picture” and meaning behind everything. You can find out more about INFJs in my book, The INFJ – Understanding the Mystic. INFJs will naturally value their top three functions a great deal. Like all types, they are at risk of having a warped perception of their other 5 functions (Yes, we DO use all 8 cognitive functions!). As a result, INFJs can see their inferior Extraverted Sensing as meaningless, purposeless, irresponsible, or short-sighted. They can repress this function, ignore it, or devalue it in other people if they’re not careful. Because Extraverted Intuition runs in the opposite direction to the INFJ’s dominant function, they can risk seeing it as overwhelming and confusing; a gigantic barrage of ideas that are out of focus and over-stimulating. Because Introverted Sensing is the INFJs 8th function, they can risk seeing it as narrow, self-limiting, and needlessly picky. Every type needs to be aware that all cognitive functions are useful and valuable. Being aware of these tendencies can help us to analyze our judgments before we make them, therefore improving our relationships with other types (in this case, our relationships with SJs, SPs, and NPs). The unhealthiest kind of INFJ will operate using a warped or distorted version of their dominant function, Introverted Intuition. They will repress their other functions and therefore become impractical and unrealistic, focused solely on their unconscious vision or image of the future. To avoid getting into this unhealthy state, we have to realize the important tie between the dominant and inferior function. Introverted Intuition (Ni), as the dominant function is like a pole with Extraverted Sensation at the base. We prefer to use Ni but without the balancing power of Se, Ni becomes detached from reality and objective data. Se gives Ni balance, it provides the objective data, the raw, sensory material, and the sense of “realism” for INFJs to bring their ideas out into the world in a tangible, effective way. Unhealthy INFJs suppress Se to such an extent that they lose sight of the data, the real world, and the raw material. Their arguments and visions lose their accuracy because they don’t have the balance of Se. Does this mean INFJs should use Extraverted Sensing a lot? Not necessarily. Using the inferior function extensively can cause a great deal of stress; but we shouldn’t ignore it either. We should let ourselves be open to it and take moments to tap into it. For an INFJ this means stopping to take a breath; it means looking around, tuning into the present moment, noticing nature, the environment, and taking stock of tangible, observable facts. The unhealthy INFJ tends to feel resentful of other people. Because of their auxiliary extraverted feeling, they feel pulled towards making others happy, but they see this as a distraction from their vision. They can become bitter towards the people they help, and they become easily overwhelmed when dealing with them. They may cut themselves off from people entirely, or do things to help people, but feel like martyrs in the process. 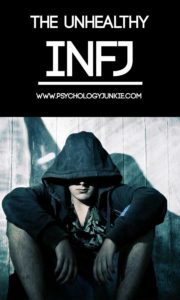 The strange thing about the unhealthy INFJ is that you may really have no idea what’s going on inside of them. Over time, through trauma, imbalance, or bad experiences, they may have realized that they don’t fit into the world, that people don’t understand them. They become secretive about their ideas, plans, and identities. They figure the less they show the world, the less criticism they will face and the less people will try to change them. They may appear isolative, eccentric, guarded, mysterious, self-absorbed, and/or resentful. Getting through a work day and forming relationships can be strenuous and overwhelming for them. The unhealthy INFJ can play ego-defensive survival games to try to get by in this kind of a mindset. They may try to shut off their emotions so they don’t feel their own loneliness and isolation. They may start to imagine that everyone around them is thinking bad things about them or hates them. They may struggle with thinking anyone different from them is “wrong” or immoral. They will feel like it’s them against the world, and that that’s their lot in life no matter what. This is a really difficult place for an INFJ to be stuck in, but if they realize they’re stuck in this place then they’ve taken the first step towards getting out. Counseling is very effective for INFJs who are in this situation. If that’s not a possibility then finding ways to support and use both intuition and feeling will help. The auxiliary functions main purpose is to support the dominant and to amplify personal growth. INFJs who can make time for inner intuition, but ALSO engage in extraverted feeling in a healthy way can experience immense personal growth. Not every unhealthy INFJ is going to fit the exact description above. They may struggle with certain aspects listed, but not all. Here are some other weaknesses to look out for that are relatively common with INFJs. Because INFJ characteristics don’t often “fit in” with a world primarily made up of other types, many INFJs feel that they have to suppress their natural styles. They may also try to awkwardly use their undeveloped or non-preferred functions. For example, when there’s a conflict that needs to be sorted out, they may just jump in and say “okay, everyone stop it and make up!” without giving anyone the needed time to sort through their disagreements and find solutions. It’s natural for INFJs to become so opposed to conflict, via their auxiliary function, that they try to sort it out so quickly that they forget their own needs, their own desires, or the needs and desires of others. In their rush to “fix” things they don’t allow the conflict to provide any real growth or effective change. INFJs are very attached to their ideas and visions, and as introverted intuitives, they can struggle with communicating those ideas to others. In a workplace environment they can find it very difficult to delegate or hand over their ideas or plans to others. They can become workaholics, insisting that their way is the only right way to get something done. INFJs don’t generally like delegating work and while they can make good mentors, they can struggle with telling people what to do or handing out responsibilities. INFJs can also get stuck in a “Ni-Ti” loop between their dominant and tertiary function (Introverted Intuition and Introverted Thinking). Because both of these functions are introverted they naturally feel comfortable to the INFJ. As a result, they can cut themselves off from relationships and get stuck in a cycle of envisioning, analyzing, and classifying, but to no tangible avail. They can become reclusive and dismissive of people and seem overly-critical when in this state. INFJs who are under extreme or chronic stress can fall into the “grip” of their inferior function, Extraverted Sensing (Se). When this happens, they can become suddenly impulsive, focused on sensory details, reckless, and thrill-seeking. They may take unhealthy risks or they may look for sensory pleasure in excess (overeating, binging on TV, drinking too much, etc,.). Some INFJs find healthier ways of experiencing Se; some clean excessively or over-exercise. Some even find good ways to deal with it; they get a massage, eat a healthy meal, or spend time in nature. You can find out more about “grip” stress here. Every type can feel lost when dealing with their 5th-8th functions. These “shadow functions” are more unconscious to us and harder for us to tap into. INFJs can “lock on” to a vision so completely that they shut out emerging information and possibilities which come through Extraverted Intuition. They can be so firm in their belief of a hidden meaning that they are unwilling to see alternative connections. That said, at times INFJs can use a combination of Ni and Ne to enjoy brainstorming and encourage an open-minded approach to life and new possibilities. INFJs can disregard Fi because they see it as “selfish” and out of touch with the needs of other people. At other times, they can use Fi in an unhealthy way; becoming locked into their personal wants, feeling critical of people with opposing values, and becoming self-absorbed in their own feelings. That said, there are moments of growth where INFJs can experience Fi in a healthy way. When this happens, they to tune in with what is really important, what their authentic, individual values are, and how to stay true to their desires. Extraverted Thinking tends to be seen by INFJs as overbearing or rigidly controlling. When they try to use it themselves they can spend unnecessary time trying to establish order, but doing it in a misguided or haphazard way. At times they can enjoy systematizing and organizing their outer world, but as Ti-users, INFJs are more likely to focus on inner mental organization than outer organization. This is where many times the “Judger” stereotypes don’t fit INFJs. Because INFJs have a dominant perceiving function (intuition) and because Te is their 7th function, they can actually appear much more disorganized and indecisive than judging stereotypes would imply. INFJs often have a tendency to ignore past data and experience. They may forget details from the past very quickly and disregard the “tried and true” method, finding it boring or overly-traditional. When extremely stressed, they may get stuck re-playing their failures from the past, feeling ashamed and embarrassed for no real purpose. As INFJs mature, they can eventually make peace with introverted sensing, and see the importance in details and methods from the past and how they tie into the context of their current lives. Want to meet your potential as an INFJ and understand more about your gifts, strengths, weaknesses and abilities? Check out my eBook here! Each type can be healthy or unhealthy or somewhere in between! Do you have any input or experiences to share? Let us know in the comments! I didn’t just come up with this information on my own! These books provided incredible insight into the healthy and unhealthy versions of INFJs. (Links are amazon affiliate links). A great read – very insightful. Although I appreciate reading about INFJ gifts and positve attributes, it’s helpful for my soul growth journey to learn about our negatives too. MBTI seems to veer more towards the +ve and I’ve been used to learning more about the -ve aspects from the enneagram (that veers more towards the -ve imo. This article helps to give me a more complete MBTI picture. As an INFJ I do of course tend to focus on self-improvement, critiquing myself pretty much constantly (well no much now actually having done intensive inner work) so it feels like there’s a need to be as balanced as possible in seeing what is good and not so good about being an INFJ. I’ve been studying mbti for years and thought I was an INFP (with a pervasive feeling that it wasn’t right) until I read this and your other unhealthy type descriptions. Wow does the unhealthy INFJ description fit me. Maybe because I’m a 4w5 I’ve always had a negative perception of Fe and an admirable perception of Fi? I know a lot of people ‘want’ to be INFJs but I can say that’s never been me. I’ve got much to mull over. Thanks for this.